With proper care, your extensions should last 3-4 weeks. The natural lash cycle is typically around 60-90 days. By the time your natural lash is long enough to safely attach to, it is near the end of it's life and will naturally shed within 4 weeks of application. How often will I need a fill? We recommend that all of our clients come in for fills every 2 weeks. It is possible to go 3 weeks, but in order to keep your lashes looking beautiful and full, you will want to maintain them more regularly. Will getting extensions damage my natural lashes? No. If properly applied and cared for Salt City Lashes clients can enjoy having extensions continuously without experiencing any damage to their natural lashes. Damage from extensions is usually the result of bad application or after care. Classic lash extensions are one individual extension attached with glue to one natural eyelash. Volume lashes are multiple thin extensions manually fanned and attached to one natural eyelash. Volume lashes are lighter, more comfortable and offer the wearer a full look no matter how many natural lashes you have. What should I expect when I get eyelash extensions? Salt City Lashes has a gallery of pictures of actual clients for you to refer to. We also have a style professional that can give you a free consultation to advise you of the best lengths, curls and shape for you individually. Everyone has a unique eye shape, face shape, eye size and look they want achieved. We will consider all of these factors to find the eyelash extensions that will suit you perfectly. To learn about any promotions, please "Like" us on Facebook. 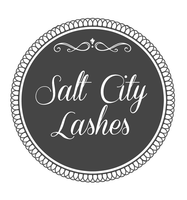 What Makes Salt City Lashes different? At Salt City Lashes we don't charge our clients based on "levels" or "tiers" of lash artists. We only allow the very best to apply lashes here and we all value one another's work equally. We want each of our clients to feel like they are getting the most for their dollar and service time. We understand that there is no standard service. We take the time to listen to what you want, and develop a service plan that will work for you. That means, if you only want a simple set that will only require an hour of service time, we are only going to charge you for that hour. All services and prices are discussed prior to the service during your complimentary consultation where you will sit down with your lash stylist and determine together what it is you want, and what it will take to give it to you. You are unique and we want to cater your experience with Salt City Lashes to you. Every other salon or individual has a set price for full sets and fills and we know from experience that getting your lashes done is not one size fits all. It's personal and we keep it at that level. Salt City Lashes also takes issues of sanitation and professionalism to the highest degree. Our studio is equipped with four relaxing recliners that are both comfortable and sanitary. Our recliners are made for use in hospitals and care facilities and we maintain the strictest standards of disinfection for all of our instruments. We understand the risk each client takes when they decide to have someone work on their eyes. We do our part to minimize that risk as much as possible. To put it simply, Salt City Lashes wants to give you a one-of-a-kind lash experience. Once you've had our lashes, you won't want to go anywhere else.